So far, all experiments that characterized the Th-229 nuclear isomer employed nuclear physics techniques: gamma spectroscopy, alpha spectroscopy, detection of electrons, coincidence schemes, and the like. For the nuclear optical clock, however, technology out of the quantum optics toolbox will be requires, such as lasers, optical detection, and precision spectroscopy. A recent experiment by the PTB, LMU, and GSI groups now made a huge step into this direction: they performed the first laser spectroscopy of electronic states in Th-229m ions. The experimental realization was truely a team effort: at first, the hyperfine structure of Th-229 in its nuclear ground state was measured at the thorium ion trap at PTB. Then, all the lasers and required optics were brought to LMU Munich to measure the combined Th-229 + Th-229m in the LMU ion trap. A U-233 recoil source was used to produce the Th-229m nuclei in the isomeric state. The combined spectrum of Th-229 and Th-229m clearly showed additional peaks that were not present in the pure Th-229 measurements. 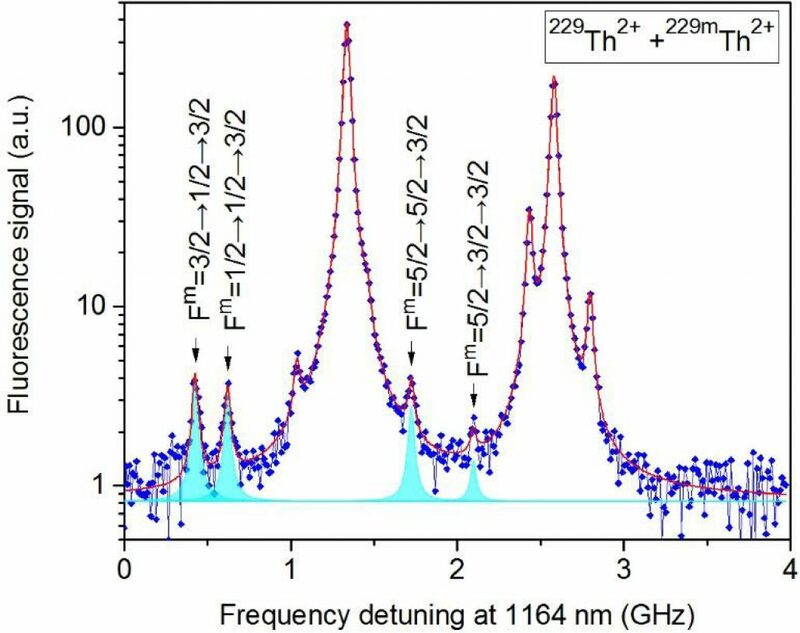 The hyperfine structure of two different electronic levels was investigated, and the number of additional peaks was sufficient to determine the A and B parameters for these two levels in Th-229m. A comparison with the Th-229 nucleus then allowed the authors to calculate the magnetic moment of the Th-229m nucleus. The value of -0.37(6) µ_N is about five times larger than the previously accepted value derived from the Nilsson model. In addition, the quadrupole moment of the isomer was determined to be Q=1.74(6) eb. From this value, one can infer that the geometric shape of the nuclear charge distribution of the isomer is very similar to the one of the nuclear ground state. The difference in the mean-square radii of the ground and isomeric states is calculated as 0.012(2) fm^2. With these values, we have a very clear image of what the isomer looks like. Following the first direct detection of the isomeric state and the determination of the isomer lifetime unter internal conversion decay, this work is the third major breakthrough within the nuClock project. The corresponding publications can now be retrieved from the arXiv preprint server here. Combined hyperfine structure of the transition at 1164 nm, connecting the 20711 and 29300 electronic states in Th2+. The cloud of ions, containing 2% ions in the isomeric state, are used for spectroscopy. The four small peaks, labelled with quantum numbers and highlighted in cyan color, belong to the isomeric state Th-229m. These peaks are not present in a pure sample of Th-229 with all ions in the nuclear ground state. The exact energy of the isomer is still unknown, but there is good news: the recent experiments at LMU in Munich have shown that a 2 percent fraction of U-233 recoil ions are in the isomeric state. Such ions can now be used for spectroscopy. 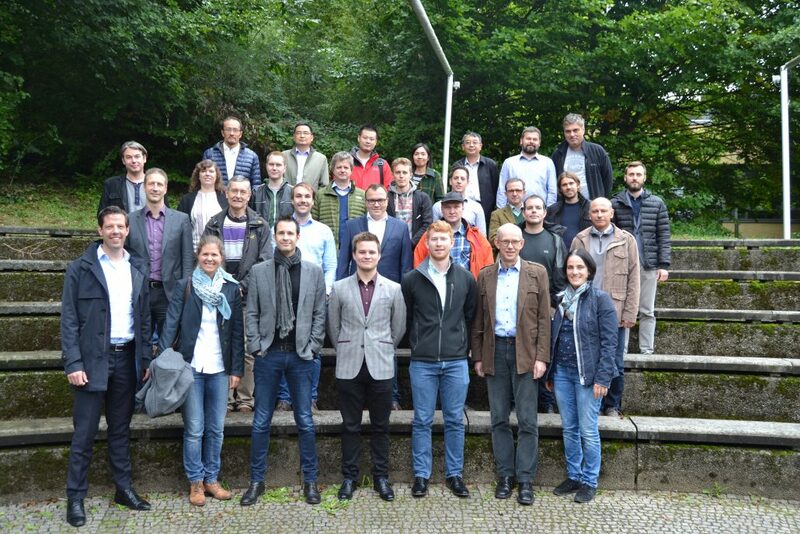 In a recent publication, researchers from MPIK in Heidelberg and PTB in Braunschweig suggest a new approach to measure the isomer energy. In a so-called LIEB process (laser-induced electron bridge), an electron combines the energy of the isomer together with the energy of a photon of the excitation laser to resonantly populate an excited electronic state. From here, it may decay down again into a lower electronic state. Such laser-assisted excitation increases the nuclear decay rate by orders of magnitude. The manuscript is now available here on the arXiv.